Round this part of China it is known as 卷心菜 (juǎn xīn cài), which roughly translates as 'rolled heart greens'. But in other parts of China, this can mean 'cabbage' in general. Vegetable nomenclature in Chinese is a minefield. Liuzhou, I'm not familiar with that term (卷心菜) for this kind of cabbage ("Napa cabbage" type) - does it refer especially to this "skinnier type" or to the squatter/rounder type as well, where you are? Baike does seem to give 卷心菜 as the sort of round "cabbage" one thinks of when envisioning dishes like corned beef & cabbage, and as you mentioned. Heh, certainly Chinese names of vegetables vary for the same thing depending on where you are - but in a way that is also true for many vegetables in different parts of the world with the same or almost identical vegetable in each of those cases. The wrinkle is that in Chinese sometimes the exact same name can refer to different vegetables depending on who is speaking and where. Liuzhou, I'm not familiar with that term (卷心菜) for this kind of cabbage ("Napa cabbage" type) - does it refer especially to this "skinnier type" or to the squatter/rounder type as well, where you are? Here it seems to refer to this specific 'skinnier type'. Most places, it refers to cabbage in general, as I said. You really should learn proper Chinese instead of that obscure minority language you insist on using! 卷同青'. Two different names within 2 kilometers. I remember the first time I came across avocados in my local supermarket here in China. The sign by the vegetable shelves had one name (I forget what now.) I took then to the weigh station and the price label had a completely different name. Then the checkout receipt had a third name. All in a day's shopping here. Interesting, Liuzhou. Is there any suggestion you get that those names were, umm, inventions or adoptions of the specific local vendors as separate from a generalized "common consensus" (so to speak) for the locality? • Incredible Edibles: Various tomatoes - Siberian Tiger, Cherokee Black Heart, Chocolate Stripe. 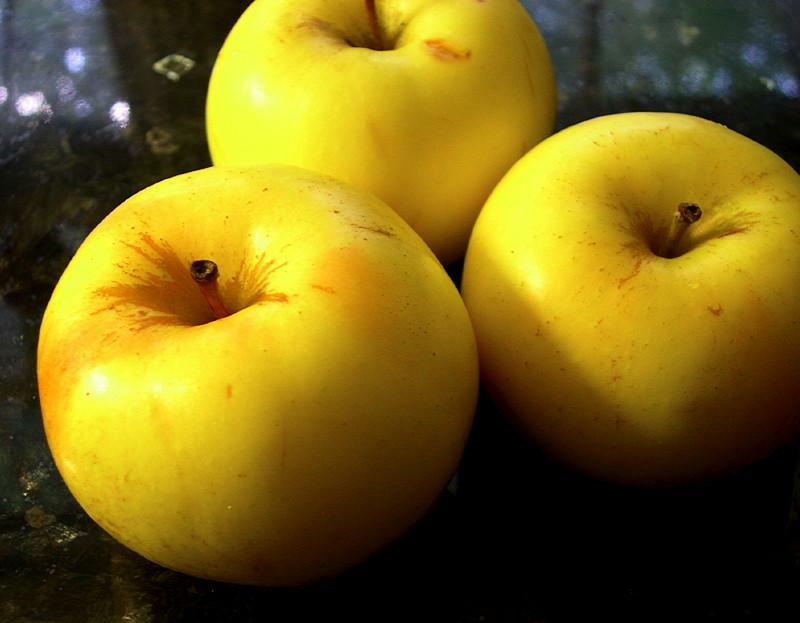 • Lee's Apple Farm: 'Pristine' apples. I'd never consciously seen these before. • Nicole-Taylor's: 1 bag fresh radiatore pasta, 2 bundles fresh spaghettini. • Funny Bone Farm: 1 head curly kale, 2 small heads densely packed broccoli + 1 teeny head cauliflower. 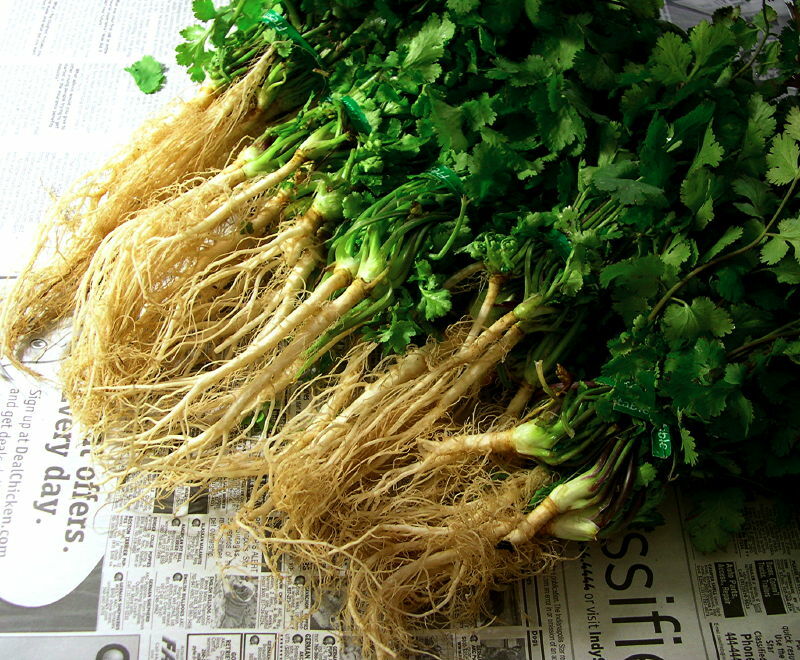 • Silverthorn Farms: 1 bunch celery leaves (Western type), 1 bunch French Breakfast radishes. • Schacht Farms: 1 doz farm-fresh brown eggs. ¶ I have a fondness for distorted/non-perfect/lumpy vegetables, especially those which might be usually offered as or expected to be found as symmetrical perfectly formed things. These were around 3 inches or so in length. • Farming Engineers: 1 head of fresh young ginger. 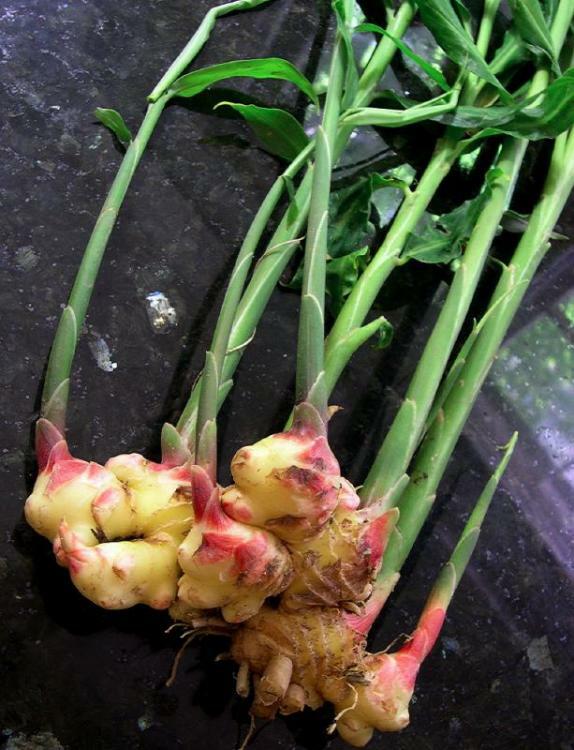 First time I've seen this kind of young-harvested pink-bract ginger around here. The topmost "rhizome"/"corm" in the pic was less than 1.5 inches across. • Mulberry Creek Farm: 6 heads of fresh Music garlic. • 1 whole Top Sirloin Cap, trimmed a bit. Is that young ginger huiray? Do you treat it almost like a vegetable rather than a seasoning? I have only been able to get it already trimmed and clingwrapped. Heidi, it is young ginger/early-harvested ginger. I intend to treat it more as a vegetable and in fact is intending to cook it w/ that ribeye I got (sliced up; it will not be a "steak") plus scallions with good oil and good salt. Nothing else. Friday/Saturday food shopping this week. This week's food/grocery shopping, most (but not all) of it; a fair bit of re-stocking. Silverthorn Farm: Baby daikon radishes. Yeager Farms Produce: Japanese 'Mangan' eggplants, Shishito peppers. Fields Farm Fresh: Standard tomatoes, Japanese Trifele tomatoes. Eden Farms: Collard greens (hydroponic). Funny Bone Farm: Red chard, Red Russian kale. 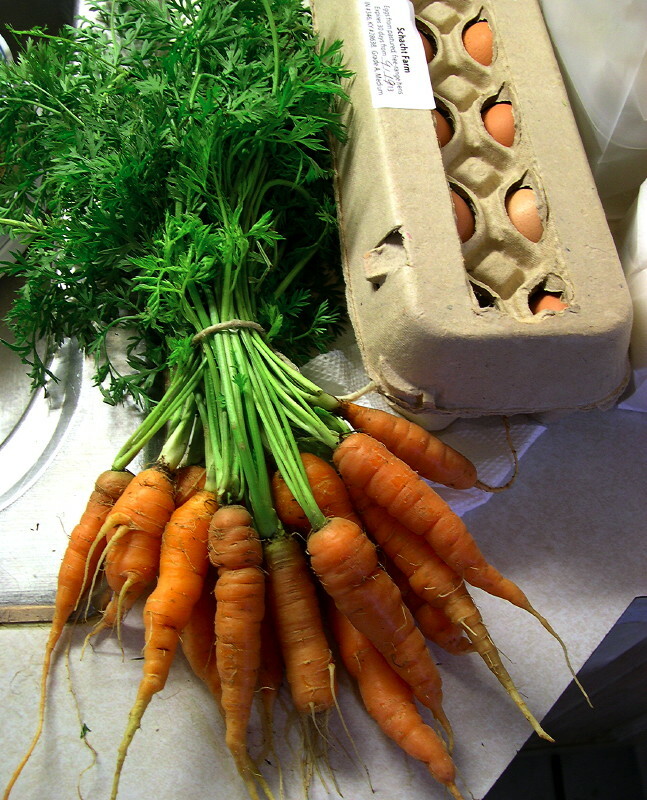 Norman Mullet Farm: Standard orange carrots, smaller/gnarly ones. Annabelle's Garden: Fresh oyster mushrooms. EV olive oil [House brand, 'Novello', Italian, 2012 harvest]. EV olive oil [California Olive Ranch, 2012 harvest]. Pasta: tagliarelle [Cipriani] & tagliolini [Cipriani] On sale!. Pasta: Capellini, linguine [both Ferrara] On sale!. Maille mustards (Dijon, Old Style) On sale!. Soured pickled mustard [Pigeon brand (Thai)]. 'Shaoxing cooking wine' (紹興花雕酒) [Lam Sheng Kee] A kind of "Shaoxing cooking wine". 'Nuerhong cooking rice wine', "fish/seafood" variety, Premium Matured [Gold Plum] (金梅陳釀 優質紹興料酒) Another kind of "Shaoxing cooking wine". Luscious soy paste [Kim Lan]. Slender bamboo shoots [Asian Taste]. Slender bamboo shoot tips [Evergreen]. Beef & tendon balls [Venus]. Soft tofu & regular tofu [Hinoichi][House Foods]. Fresh pork spare ribs (short cut). Fresh vegetables: Mung bean sprouts, Taiwan bok choy (a variety of "Napa cabbage"), green onions, fuzzy squash (Chinese hairy gourd), bitter melon. • Silverthorn Farm: Baby leeks, Tuscan kale, young daikon. • Bloomer's Greenhouse: Brussels sprouts on the stalk, Purple Peruvian fingerling potatoes. • Funny Bone Farm: Ripe tomatoes, parsnips, std orange carrots, red Russian kale. • Brotgarten: Epi wheat branch loaf. • Fields Farm Fresh: Trifele tomatoes, orange snack peppers, Romaine lettuce, Red Leaf lettuce, Marconi sweet peppers (green-streaked red ones). • Norman Mullet Farm: orange carrots. 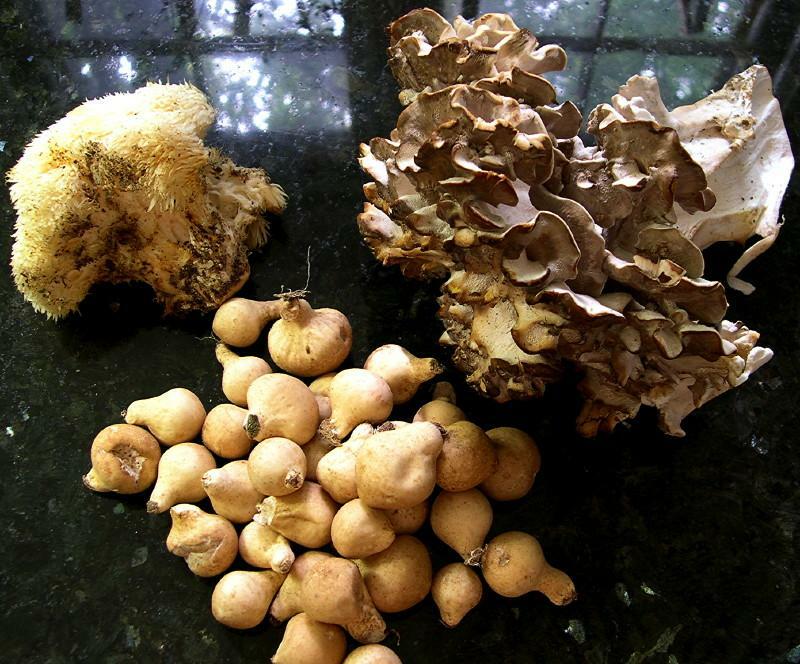 • Annabelle's Garden: Maitake mushroom (a large piece) (Grifola frondosa), Lion's Mane mushroom (Hericium erinaceus), Pear Puffball mushrooms (Lycoperdon pyriforme). Bamboo shoots (whole; and sliced) [First World brand]. Scallions (6 bunches @ 3 bunches/US$1). Chinese long beans (Vigna unguiculata ssp sesquipedalis). Fresh small "tung koo" mushrooms (Chinese shiitake type). 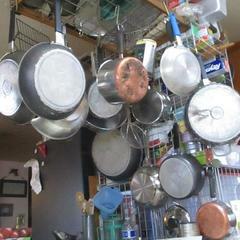 Shaohsing wine (cooking) [Wei Chuan]. Rose wine (Mei Kuei Lu Chiew) [Golden Star]. Sour (pickled) mustard (Harm Choy/Syun Choy). Chinese crullers (Yau Char Kwai). Fuzhou flour vermicelli, extra thin [sun Kee]. Flour vermicelli, Taiwanese, hand-made [Hung-Ming]. Cellophane noodles (mung bean threads) [Long Kow]. Fine rice noodles (Mei Fun) [buddha brand]. This place has a fresh meat counter about 90-100 feet long. Heaps of meats, often at very good prices. Basmati rice (10 lb) [Zebra]. Basmati rice (15 lb) [Royal]. Shoop (brand) instant noodles: 'Spicy Lemon', 'Bombay Biryani', 'Masala' flavors. Sweets: fresh Ghujia; & Gulab Jamun "sandwiches" (stuffed w/ paneer). 'Instant Noodle King' Wonton Soup Flavored noodle packs. 'Dragonfly' Hot & Sour Shrimp Flavor instant noodle packs. Plus sockeye salmon fillets and wild-harvested shrimp from my standard Western grocery down the road. Pic of the Maitake, Lion's Mane and Pear Puffball mushrooms I got today. I didn't plan it this way, but just three things: two pounds of butter, two pounds of flour, two pounds of well aged cheddar. I could make a pound cake or something. • Fields Farm Fresh - standard tomatoes. His last harvest, brought in before the first hard frost of the year a few days ago. 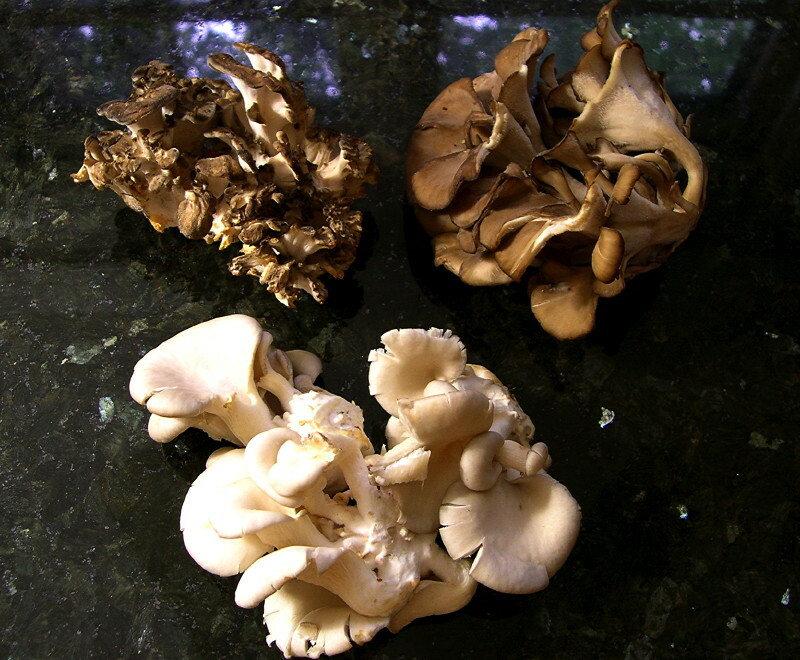 • Annabelle's Garden - Maitake mushrooms (2 different cultivars, both also different from the one I got last week), oyster mushrooms. • Schacht Farm - eggs. Funny Bone Farm - daikon, std orange carrots. • Whipker Azalia Farm Market - Carnival squash. Merguez sausages, prosciutto ham (this one is much redder than normal, I think the manager said something like it being "Prosciutto rosa"...? ), Finocchiona salami, Belgian Chocolate gelato, local yellow carrots. Fresh ginger, fresh turmeric, Opo squash (浦瓜), Taiwan Bok Choy (台灣白菜), scallions (lots), a small striped bass (live from the tank, head bopped & gutted there), stewing chicken (frozen), fish meat "emulsion" [Venus brand], fresh skinny wonton noodles, Kimchi bowl noodles [Nong Shim] (a case). 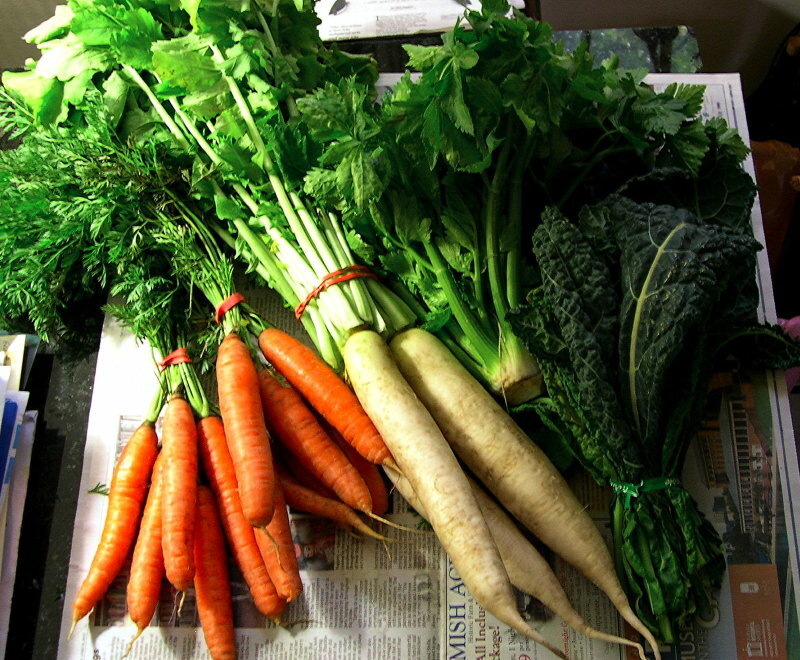 Baby daikon, orange carrots, ripe tomatoes (harvested before the freeze), leeks w/ really long white parts, turnip greens, baby curly kale, broccoli florets, brown-mottled eggs, green eggs, beautiful big fresh Napa cabbage, small orange sweet "snacking peppers". Crème fraîche, California Olive Ranch EVOO, Godiva chocolate, nice fillet of turbot, salted potato chips [Kettle]. Bauernschinken, coarse Braunschweiger, pressed tongue, smoked Kielbasa. Half a loaf of semolina bread, honey-oatmeal biscotti. Yesterday I went in to the new Trader Joe's in Buffalo - didn't have a fridge to keep things overnight so limited myself to foods not requiring refrigeration. I have never heard of this until now. There is a facebook page fro fans of it. I will look to see if it is available here in southern California. May go to TJs after church since it is in the same area. Picked up a jar of the crunchy. I was going to pass since that balance of ingredients did not seem South Beach Diet friendly to me. My DW thought is looked interesting so we bought a jar. 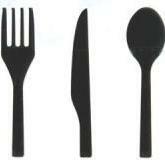 I had a taste off of a spoon. I could get into serious trouble calorie-wise if I started eating it. Very tasty but I want to keep my A1C down where it belongs.